At TCM, we don’t just hire trailers, we manufacture them too. In addition to our hire service, we custom-build trailers to your own specification, with sizes ranging from 3m up to 7m in length, all of which can be towed behind a 4×4 or van for ease of use. We offer a full hassle-free service from design to build to after-sales servicing and refurbishment, and for many of our clients we also provide ongoing support, moving the customer’s own trailer between locations if they do not have a suitable towing vehicle or experienced driver. We can also store your trailer at our base, conveniently located in the Midlands and within striking distance of the whole of the UK. 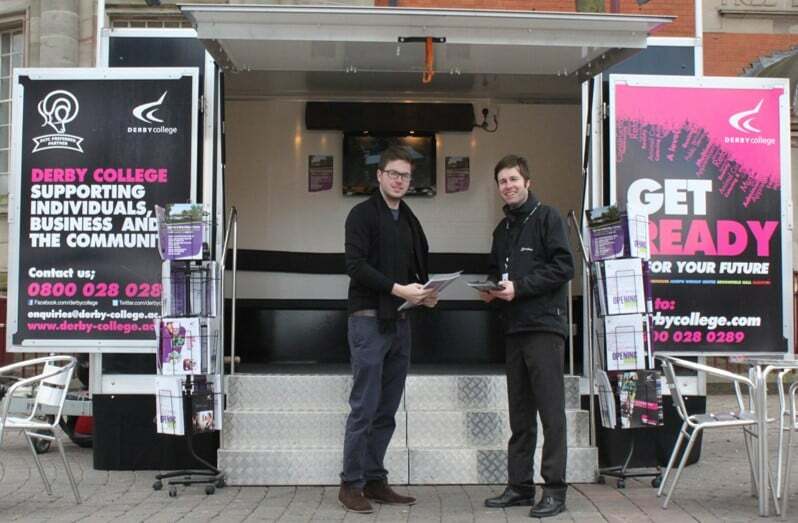 We now also hold stock of ready-to-go 4.3m exhibition trailers – meaning you can collect today and exhibit tomorrow. Call us for our latest stock and drive away today! Chatsworth range – 3m to 6.5m in length with a hydraulic lift-up canopy and wing panel doors. Hardwick range – 4m to 6.5m in length with barn doors and a wind-out canopy. Eastwood range – 5m to 6.5m in length with glazed sliding doors and premium interior fittings. Alternatively, if you have ideas about the size and design of trailer you want then speak to us about customised trailers built to your own specification. Sizes range from 3m up to 7m in length, all of which can be towed behind a 4×4 or van. 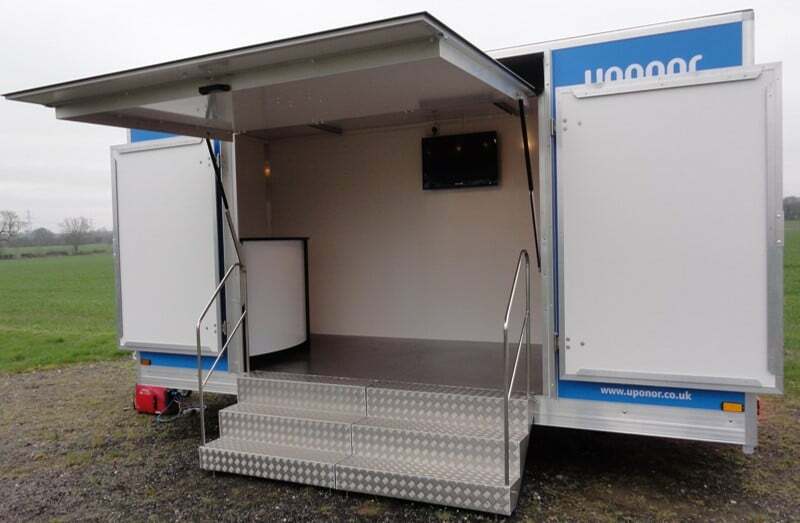 Our exhibition trailers come with carpet tiles or vinyl floor, electric pack including sockets and spot lights, and a spare wheel is included as standard. 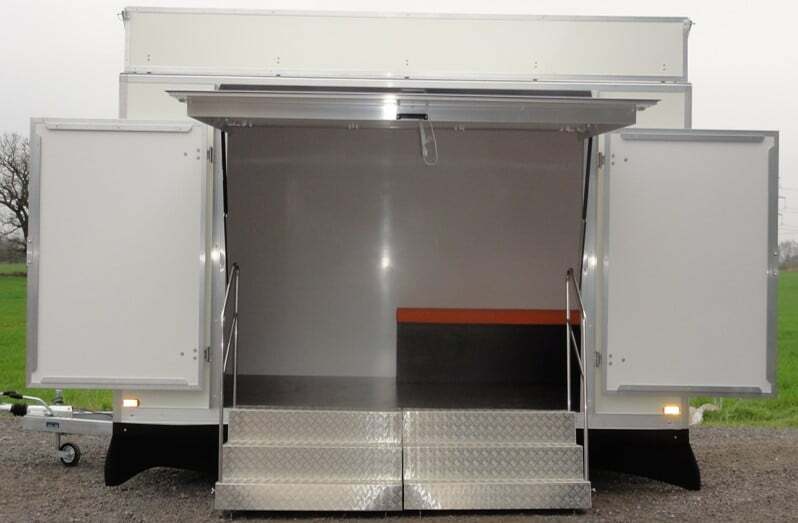 On top of this basic trailer, you can choose from a range of additional options which include built-in cupboard space, bench or free-standing seating, header boards (on top of the trailer for marketing boards), rear personnel doors, kitchen units etc. All internal cupboards and fittings are hand built to the highest quality to your specification. TCM merchandising trailers are based on a similar specification, but on to the basic shape we build retail counters with safety-glass counter top for display, and shelving underneath. 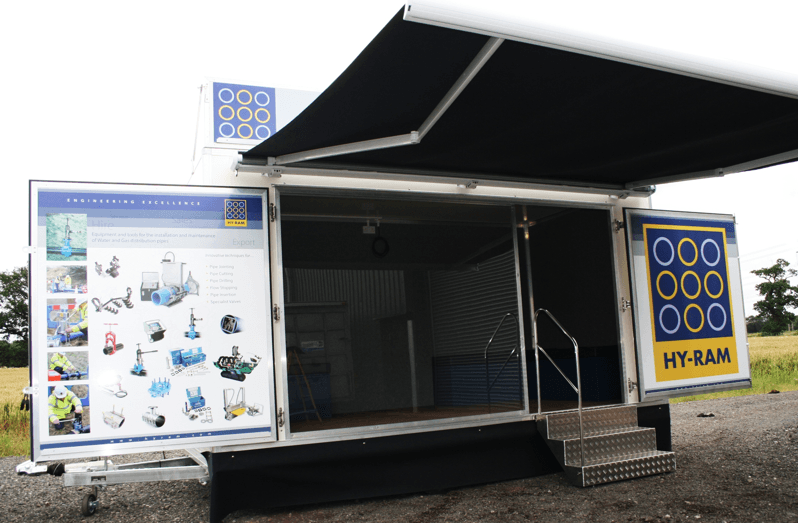 The counters are removable, so our merchandising trailers can be easily converted back to an exhibition unit if required for promotional activities. The internal back walls of the merchandising units can be fitted out with high quality slatwall with aluminium trim for displaying goods. The internal layout of our merchandising trailers can be built to your detailed specification with many colour choices of boarding and slatwall available. We are happy to provide a quote to your detailed specification, or if you aren’t sure what you need, why not arrange to visit us and have a look at the retail and merchandising trailers on our hire fleet to give you some inspiration? We are conveniently located in the heart of the Midlands, with our storage unit in Lichfield, Staffordshire, only minutes from the motorway network. 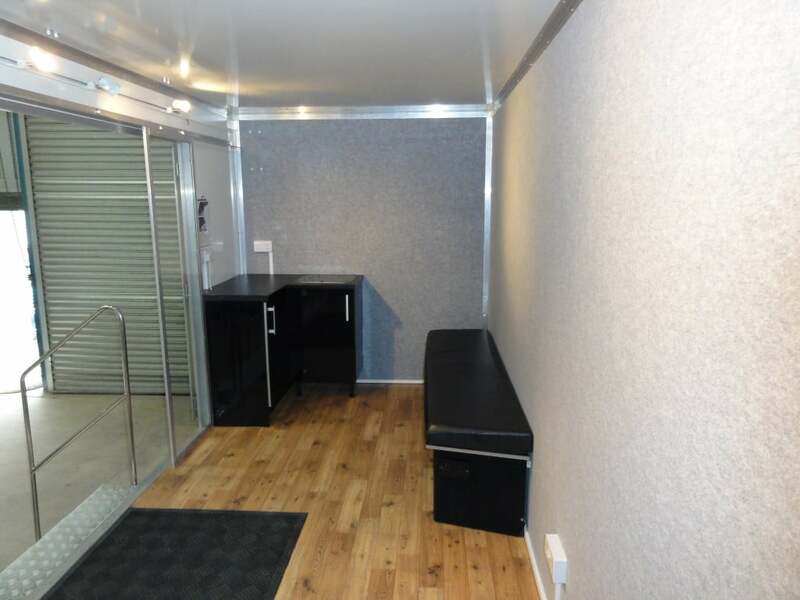 We will happily show you the different size options and you can view some of the trailers we have built, look at different internal fixtures and fittings such as furniture, kitchen areas and storage and talk to us in detail about your plans. In line with current UK legislation, all our trailers are individually type-approved by VOSA to give you peace of mind, and we offer 12 months’ warranty on trailer builds, subject to normal wear and tear. TCM Trailers occasionally have second-hand trailers for sale, which could be a great solution if your budget doesn’t extend to new build or if you need a trailer very quickly. 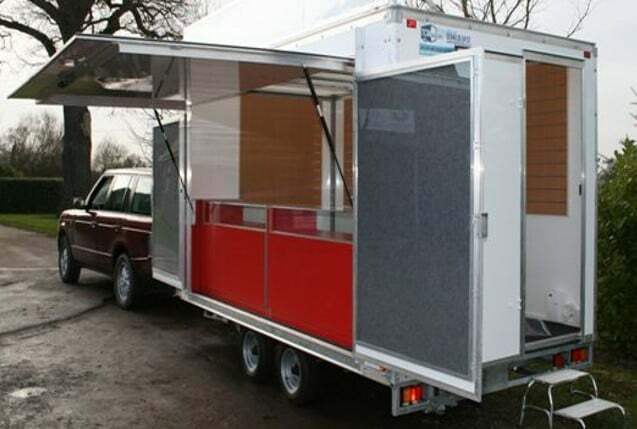 Used trailers can either be sold as seen, or we can offer a refurbishment package if the current internal set-up doesn’t meet your needs – for example, by adding a kitchen area, additional seating or cupboard space etc. The availability of our second hand trailers changes regularly so contact Lindsey on 01543 546474 to find out about our latest stock. Don’t forget, if we don’t have a secondhand trailer to hand, why not try a long-term hire option for a low-risk alternative? Many of our clients have hired for a season first before committing to a new build, or whilst they are securing the capital and building their business case for investment. Typical prices for custom-built exhibition and merchandising trailers are included below, but for further information about the range of options available, please call Lindsey on 01543 546474. 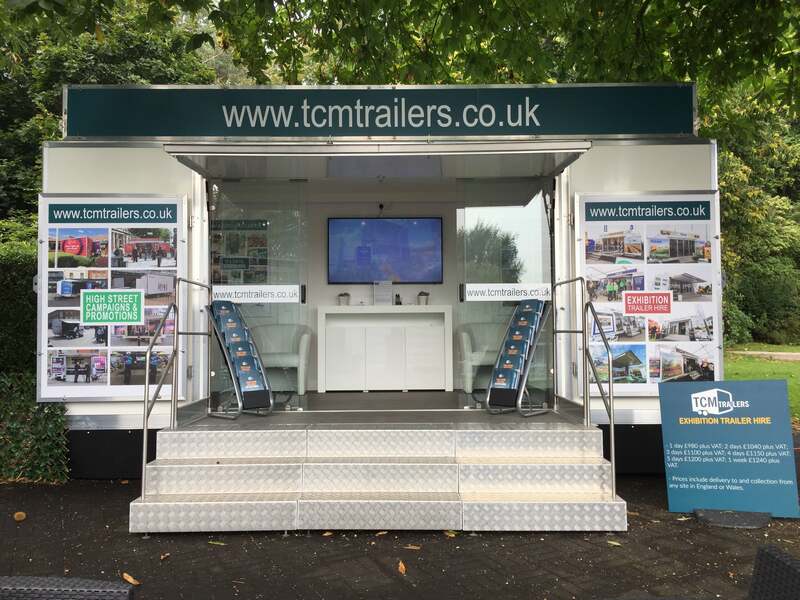 TCM trailers are built on a fully galvanised chassis, of GRP construction, and come with road lights, corner steadies and a spare wheel as standard. Trailers comply with current UK legislation, all trailers have VOSA individual vehicle approval, and are provided with an electrical certificate. Prices include vinyl flooring, electric pack including spotlights and two double electric sockets. Additional options include header board on top of trailer, additional lights and sockets, Velcro-compatible walls, a range of internal seating and storage options, Perspex doors, rear personnel door and trailer graphics. We require a 50% deposit with order, balance on completion, and build time is usually 12-14 weeks (subject to specification).